Katy and her (imaginary) dog Paul Williams live with their sister Hannah in a sleepy coastal town. When lonely teenager Ryan moves there from the city he and Katy make a connection that will shake their worlds forever. Playful visual storytelling with a live electronic score about autism, friendship and a very big wave. We Live By the Sea was developed alongside the National Autistic Society, and with the generous support of London Contemporary Theatre and Hounslow Arts Centre. It enjoyed successful runs at the Edinburgh Festival, the SoHo Playhouse Off Broadway, the Arts Theatre, West End, two award winning runs at the Adelaide Festival Australia, a tour of China, and opened the prestigious Brits Off Broadway season at 59E59 Theaters in New York. It has a live electronic soundtrack written by our acclaimed band The Mason Brothers. 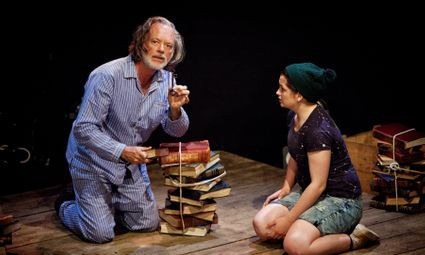 It was nominated for a Fringe First at the Edinburgh Festival, received excellent reviews in publications including The Stage and The Scotsman, and was the Pick of the Fringe in The Times. After its run in New York it was chosen as one of the Top Memorable Theatre Moments of 2016 in the New York Times, and won three awards at Adelaide Fringe including the prestigious Grahame F. Smith Peace Foundation Award for promoting human rights through theatre. During Brits Off Broadway it was Critics Pick in the New York Times. In Adelaide to cover the festival proper, I was sent to this small production by the glowing review of a critic friend: “This is exactly what a fringe festival show should be.” As you enter the tent, 15-year-old Katy (Alex Brain) asks if she could please tap your shoes. For Katy – who lives with her sister Hannah (Alex Simonet) and her imaginary dog Paul Williams (Lizzie Grace) – the shoe-tapping is a way of greeting people and the beginning of your hour-long journey into the world of autism: not only what it’s like to live with, but what it’s like to fall in love with. Young theatre company Patch of Blue worked with the National Autistic Society for this work, which is by turns playful, funny and deeply moving. Through a live score and innovative set-pieces, they build whole worlds by the sea where the two teenagers live alone after the death of their father, before a new boy Ryan (Tom Coliandris) moves to town. The show had sellout seasons in Edinburgh, New York and London – but there are remarkably still tickets available for the Adelaide run. Bring tissues. We Live by the Sea is Katie’s story: a story about her imaginary dog Paul Williams, her big sister and her new best friend Ryan. It documents her summer holiday adventures and her big presentation to her classmates when she returns to school. It's feelgood and funny, honest and above all completely believable. Katie doesn't like to be touched, she doesn't like too much noise, she likes to stick to her routine and takes things literally. Katie has autism but that doesn't stop her sharing her story, it spurs her on. Alex Brain’s performance in the central role is mesmerising as she balances humour and frustration, breaking the fourth wall to chat to the audience whilst committing completely to the scenes within her story. She is ably supported by Alexandra Simonet, Lizzie Grace and Lloyd Bagley who skilfully represent her important relationships. Simonet’s quiet fear and pride underscores Brain’s exuberance and her moments of vulnerability are particularly moving. It would, however, have been pleasing to know a little more of Ryan's backstory. The inclusion of live music adds to the rising and falling emotions and swells the noise in Katie’s head. When she describes her "big wave", the stage is awash with music, emotion and discrete but powerful projections. Although the Attic is a cramped performance space, this makes the performance feel all the more special as it unfolds with the audience almost as part of the action. 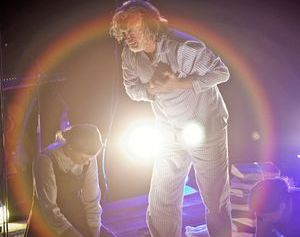 We Live by the Sea is an outstanding piece of theatre with a big heart and carefully honed performances. I cried freely throughout as did the rest of the audience. It's rare for theatre to connect in such a way and Patch of Blue has created something very raw and beautiful. It felt like the softest of hands had reached out, intertwined its fingers with mine, and squeezed as if to say: we get it. Patch of Blue theatre, alongside the National Autistic Society, are taking the path less-trodden. 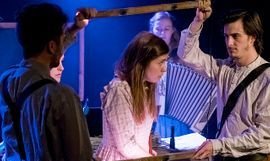 Using the sensory potential of theatre, a platform is given to girls with autism in this spine-tingling tale of finding connection where you least expect it. As a sister to an autistic brother, I hold my breath when a yellow-coated girl and canine-like companion bounce into the queuing crowd to ask if they can tap my shoes. Then within the intimacy of the attic, taking in the projected seaside backdrops, multi-coloured lights, and euphorically soaring live music, this frozen breath seeps out in relief. They’d got it right. We Live by the Sea is Katy’s story. Directed by Alex Howarth, this collectively devised production gives an innovative glimpse into Katy’s obsessive routines, literalism, and love for the colour purple as she navigates the overwhelming world around her, told through her blossoming friendship with a boy named Ryan. The modestly masterful storytelling is warmly delivered by intelligent performances. Beating loudly at its heart, Alex Brain – playing Katy – is breath-taking. It is rare to see such an enchanting example of autism depicted so sensitively. Orbiting around Katy, each character dips a toe in her world – providing a complete and honest picture of her life. We even hear the thoughts of Paul Williams, Katy’s best friend and imaginary dog, ingeniously brought to life by Lizzie Grace. This loyal partnership makes the joy which Katy finds in the kindness of Ryan – played by the charming Lloyd Bagley – even more endearing. With a smile that could heal a thousand hearts, he breaks down Katy’s barriers, fascinated by her remarkable honesty which mends his fractured, though brushed-over, backstory. Providing the shade to Katy’s light is her sister, Hannah. Though worn from the difficulties of Katy’s condition, and left parentless by the seaside, Hannah exhibits an inspirational endurance in fighting for her sister’s cause. Alex Simonet subtly executes this complexity, moving with the uncertainty of both their futures. The success of this production lies in spotting the difficult experience of autism echoing through the creases of its comforting fingers. Sea-deep and honestly-interpreted research renders We Live by the Sea an informative and special immersion into the lives of those shaped by autism. Patch of Blue have created an uplifting wave, leaving behind beaming smiles, streaming tears, and a poignant message of the connections we can make when we use a ‘different kind of thinking’. This is my Fringe gem, a treasure that I will bury in the burning cockles of my heart. Tapping the shoes of every audience member three times as they enter is an unusual way to start a show, but those are the rules and rules are very important. We Live by the Sea is all about the rules – or rather, about learning a new set of rules and a new way of thinking. It is a devised piece by London-based Patch of Blue, developed with support from the National Autistic Society and Greenwich Theatre. Katy, an autistic teenager who loves the seaside and dancing, tells the story of how she, her sister Hannah, and her imaginary dog Paul Williams become friends with Ryan, a new boy in town who comes to appreciate Katy for who she is. We Live by the Sea does a good job of providing insight into some experiences of people on the autism spectrum. For the most part this is done through Katy’s simple and honest account of what she is thinking, with additional explanations provided by Hannah. At one point, several loud voices and an even louder clicking sound overlap while lights flash, giving the audience a taste of how overwhelming things can get when your brain isn’t filtering out extraneous sensory input. While we see that taking care of Katy can be difficult for Hannah, the focus is on Katy’s good qualities and how they can be just what someone is looking for in a friend. Too often the narrative tendency in our culture would be to applaud Ryan for befriending someone different, but that is not the case here. Ryan needs a friend like Katy as much as she needs a friend like him, and We Live by the Sea is primarily a celebration of who Katy is as a person. Like Katy, this play is a bit different and full of playfulness, fun, and original thinking, with emotional highs and lows. The acting is excellent all around, though Alex Brain as Katy stands out in particular for her physicality. Fairy lights, projections, and the live music all contribute to making this an aesthetically pleasing production. With over one percent of the population in the UK on the autism spectrum, it is important to try to understand it. 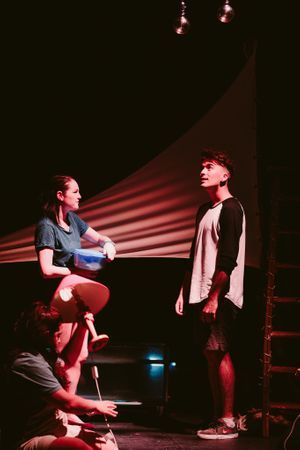 We Live by the Sea provides an informative, positive, and respectful portrait of an autistic girl, while being a highly engaging, inventive, and outstanding piece of theatre. "Even the biggest dragons can be slain if you have someone fighting with you." It's a twee motto, but it perfectly encapsulates this wonderful play about the power of human reliance upon one another by young company Patch of Blue. 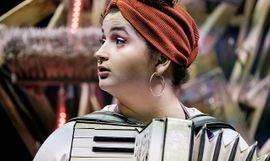 Developed in association with the National Autistic Society and Greenwich Theatre, it tells of a teenager called Katy whose autism causes her to live with one foot in the real world and one in a reality of her own devising. For her, life is creating fairy stories and best friendship with her imaginary pet dog Paul Williams, who appears to manifest as a young woman her own age. The only person left to care for Katy is her sister Hannah. Into their world comes Ryan, a teenage vlogger with a sense of youthful altruism and a recent tragedy of his own which he needs to find a way through. His presence is reassuring for both young women, but confusing as well; for Hannah, who mistakes her need for company and support with a desire for a relationship, and for the innocent Katy, who gives the sense she might easily be broken if disappointed. One of the most refreshing points about the piece is that it searches for something more than simple cliche; refusing to allow Hannah to resent Katy, or to let Ryan be a selfish male other rather than someone genuinely caring. There is humour in Katy's relationship with Paul, sadness in her recollections of running the gauntlet of bullying at school, and a sense of raw ingenuity to the live score, composed by Wovoka Gentle. It's a refreshingly strong piece of work for such a young company, and Katy's eventual public revelation of her own being has been built with such skill by director Alex Howarth that the audience gladly fills in the applause of her classmates. Katy likes to touch people’s shoes. She likes the sea. She does not like crowds or loud noises. She does not like anyone to touch her. Produced in conjunction with the National Autistic Society, We Live by the Sea is an inventive and well-judged piece that invites its audience to experience the world through the eyes of a 15-year-old autistic girl. Following the death of their dad, Katy lives with her sister in a small coastal town. Katy’s best friend is an imaginary dog called Paul Williams, who is played by Lizzie Grace. Paul helps Katy cope with the world, and his presence allows us to better understand Katy’s thought processes – this is most potent in a scene in which Katy and her sister are in the car. Katy becomes increasingly upset, and, while we understand the source of her distress, we also see how exasperating, and at times dangerous, her behaviour can be to those around her. It feels like everything has been very carefully considered. Alex Howarth’s production is so light and tight that you can forgive it the occasional sidestep into fairy-lit whimsy. Katy remains Katy throughout, and the production is always clear about that – there are no easy answers or magic cures. The standard of performance is high all-round, but Alex Brain’s performance as Katy is incredible, sustained, rich and funny, her timing exact. Informative without being worthy, this a really appealing piece. Lovely stuff. Patch of Blue theatre company have something quite special going on, as they've proved with several big-hearted Fringe shows in recent years combining touching, poignant stories with exuberant theatricality. And We Live By the Sea is no exception – a show that can bring a tear to the eye while wowing with its homespun stage inventiveness. Katy lives in a sleepy coastal town with her imaginary dog Paul Williams, and she likes things to be just so – same routine every day. Her sister Hannah struggles to cope with Katy's demands, and when newcomer Ryan – a teenager from the big city with demons of his own – strikes up an unlikely friendship with the two young women, he looks set to disrupt their fragile world. It's a show about autism, but it never feels preachy. Instead, its themes and quiet revelations about the difficulties and opportunities of the condition are embedded within a story about believable people – and performances, especially from Alex Brain as a relentlessly needy but joy-filled Katy, are vibrant throughout. There are a few things that don't quite hang together – not least why troubled Ryan should miraculously fall in with the two women – but it's a tender, moving hour of warm-hearted theatre. YOUNG London ensemble Patch of Blue’s self-devised work is an extraordinary and joyous journey into the world as viewed by a teenager living on the autism spectrum — and those whose love enables them to embrace the honesty required of that vision. As Katy, a 15-year-old who lives with her older sister by the sea, Alex Brain gives a remarkably nuanced performance with her emotional outbursts, socially isolating behaviour and physical ticks tempered by the simple eloquence, order and beauty of her imaginary inner world. Key to this story within a story is her invisible dog named Paul Williams, played with all the super-animated, goofy enthusiasm and endearing loyalty of man’s best friend by Lizzie Grace. Big sister Hannah (feistily portrayed by Alex Simonet) has also had to become parent to Katy and tempers are beginning to fray until the arrival of 17-year-old Ryan (Tom Coliandris, who brings a loveable dash of young Hugh Laurie to the role). Ryan has moved to the seaside to deal with his own bereavement and an overwhelming sense of guilt. Together with the sisters, he finds a special connection to fill the void in each other’s lives. Simple props — a sail, a ladder, an aquarium and two lamps — are complemented by some ingenious lighting and video effects, with bare bulbs hanging overhead and a torch shone through a bottle of water to create a shimmering ocean. It’s funny, dramatic, emotional and insightful, all backed by three musicians performing a top-notch live score with original songs. Every once in a while a piece of theatre comes along which makes me remember why I have always loved the power of theatre and how beautiful it is when a story is so well crafted and presented that it can completely envelop an audience and mesmerise with its emotive message. “We Live by Sea” does just that. At the Edinburgh Festival it was nominated for a Fringe First and sold out the complete run. Little wonder. The play deals with the difficult subject of autism and takes us inside the world of a beautiful autistic girl, Katy; an imaginary dog, Paul Williams; Hannah, her sister and carer; and Ryan, a newcomer to the seaside town who has his own demons to deal with. This is a sensitively written play about the often misunderstood mind of an autistic person and it is mesmerising. The extremely talented musicians play an integral role in the unfolding of the story as does the sea and the repeated references to it. I urge anyone who loves theatre to see this production as it reinforces the role this art form can play in developing understanding of anything we find hard to accept, often because of lack of exposure and awareness. Amazing, wonderful, a definite must-see. Sometimes during an arts festival something really touches you. It is raw and wonderful and makes you feel. I was lucky enough to have such a special experience on the opening night of the Royal Croquet Club this Adelaide Fringe. The show is called We Live By the Sea- Adelaide Fringe 2017 and it’s fresh from SoHo Playhouse (New York), the London’s West End and a sold out Edinburgh Fringe season. Not surprising after seeing the show for myself. The story is told through the eyes of a girl with autism, Kate, her sister Hannah and Kate’s imaginary dog Paul Williams. I can not recommend this show to people enough. If you love a good, deep and beautiful piece of theatre, do not miss this one. Without a doubt one of the most moving shows I have seen in years. I laughed, I cried so hard my tears were dropping from my chin and at the end I jumped to my feet for a standing ovation. Katy wants to tell you a story. It’s a lovely thing and she wants to tell you this story, a story with a beginning, a middle and an end. Oh, and there’s a story within the story but she hopes you won’t mind. Well, this audience member certainly didn’t mind. Local producer Joanne Hartstone is to be commended for bringing this engaging and heartfelt piece, developed by Patch of Blue and Greenwich Theatre to 2017 Adelaide Fringe audiences. An hour races by as you enter the world of Katy, a 15 year-old girl living on the autism spectrum. She has her best friend, an imaginary dog named Paul Williams and lives with her older sister, Hannah. At times heartbreaking and at others hilarious, as the older sister of a young severely autistic woman myself, this piece spoke to me on many levels; the dizzying highs and crushing lows of caring for someone for whom the world is so overwhelming, were all there. Never patronising, the performances were sincere without being earnest, nuanced without being indulgent. The inclusion of a live band performing music was fantastic and the creative staging and lighting effects brought not only the seaside theme but also the sensory difficulties Katy faced to the fore. 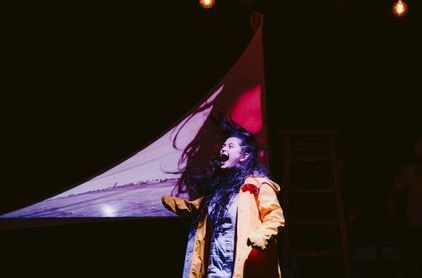 We Live By The Sea is a moving, aesthetically rich production with pitch-perfect performances and it is my hope that it will be one of the hits of this year’s Fringe. A small, overcrowded, swelteringly hot room at the Fringe is not exactly the ideal space for a show which discusses autism, but Patch of Blue make it work in this delightful ensemble piece. Building on solid groundwork laid out in Back to Blackbrick at last year’s festival, the company return with another moving yet gloriously mischievous show. 15 year-old Katy (Alex Brain) is autistic. She tells us that every question must have a correct answer. Every story must have a beginning, middle and end. Her own is set in a seaside town where she lives with her 19 year-old sister, Hannah (Alexandra Simonet), and her imaginary dog, Paul Williams (Lizzie Williams). Life has been lonely for the parentless sisters until the arrival of Ryan (Lloyd Bagley), who forms a lasting friendship with Katy. We Live By the Sea doesn’t shy away from frank discussions around the challenge of living with autism, but also celebrates the value of dismantling ignorance toward the condition. It humbly presents Katy’s life with nuance and consideration, depicting her need for order, certainty, routine, but also her equal desire to lose control and have fun like everyone else. The coastal setting provides gorgeous imagery—full of picturesque cottages and warm sandy beaches—as accompanying folksy songs are performed by a live band. While there are definitely one or two things to work on—Ryan’s backstory is underwritten and his assimilation is slightly implausible—We Live By the Sea superbly captures a rich life in motion. Katy is going to tell us a story. Stories are important to Katy, as are rules. Fifteen-year-old Katy lives with her elder sister Hannah in a sleepy coastal town by the sea. A sea that waves to Katy, drawing her to it, forming a metaphor for her emotions and a home for some of her tales of bravery. Katy is on the autistic spectrum and finds it difficult to connect to people, but with stories, well that’s when she does some of her best and bravest thinking. She stands before us, smiling and swaying with eyes closed, as she describes some of the things she likes. One of these is Paul Williams, an imaginary dog (a somewhat unlikely Jack Russell / St. Bernard cross), with a few ticks of the physical rather than the insect kind. Together they share a secret language and plan their days. Routine is important too; from teeth brushing to when to eat Marmite to what colour of clothes are worn on which day. Purple is a brave colour, worn by the knights of her tales as they take on the noisy dragons. Loud noises upset her, but the ear protectors she wears make her stand out from the other pupils, who abuse her for being different. Main stream schooling puts other demands on her that are difficult to meet – like the forthcoming address she needs to give in class. With their mum and dad gone Hannah is left to provide support, but when new boy in town Ryan arrives there are new friendships to be made. Troubled by events from his past he finds Katy’s honesty just what he needs. And Katy likes him, he likes her stories and he’s even friends with Paul Williams. Even the biggest dragons can be fought if you have someone fighting with you. What they will need is a different kind of thinking. Live music and video projections form a backdrop to the utterly credible central character. The other parts are less well rounded. Ryan’s back story and the ease with which he is accepted feels somewhat under developed. A unique, inventive piece of theatre that is touching, heart-warming and enlightening. Katy loves to tell stories, often about knights, princesses, and bravery, but this time, she’s telling her own story, and it’s an enchanting one. Katy is on the autism spectrum and often finds it difficult to connect with people including her sister Hannah who she lives with. Her only real friend is her imaginary dog, Paul Williams, with whom she shares a secret language, and a friendship. Paul Williams is the only one who really understands her until Ryan comes along. The show is a well constructed, wonderfully conceived, and cleverly executed piece from an exciting company who aren’t afraid to tackle challenging subject matters. Known for their excellent musical theatre productions, Patch of Blue has woven that musicality into this piece in a totally fresh manner. Used to demonstrate to the audience the sensory overload that Katy feels on occasions, the live music becomes integral to the piece. The piece is a truly unique piece of theatre. 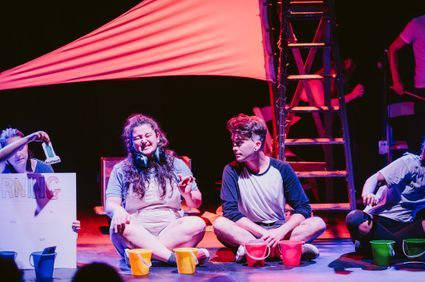 Beginning before you even set foot in the theatre, the show manages to craft a truly credible central character, offering a window into living with autism for an audience while also presenting a really inventive, and emotionally engaging story. Coupled with fantastic performances, the show really is captivating. We Live by the Sea needs some further refinement in certain areas but is nonetheless one of the most interesting pieces of theatre you will see in Edinburgh this year. 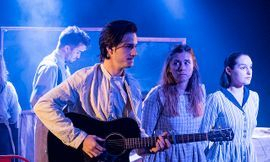 Patch of Blue have clearly pushed themselves in this production, and in so doing have created a truly memorable piece of theatre that marks them out as a company to watch. When two sisters flee the commune they’ve grown up in, they discover a harsh and beautiful world they never knew. Playful, visual storytelling with original songs. When We Ran opened at the Pleasance Courtyard to excellent reviews, and performed at Mervyn Stutter's Pick of the Fringe. ★ ★ ★ ★ ★ 'a masterclass in the ensemble' by West End Frame. Our first play won the IdeasTap Edinburgh Previews Award, opening with a sell out run at London's Earl Haig Hall. 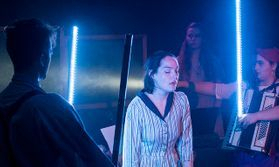 After an extremely successful run in Edinburgh during which we were shortlisted for the NSDF Emerging Artist Award, the show enjoyed a sold out transfer to Theatre 503, London's premiere new writing theatre. We next performed Beans at The New Wimbledon Theatre and Brighton Fringe before a final show at the Incoming Festival at The New Diorama in London, which we were asked to perform at as one of the top emerging companies of 2015. We were honoured to perform our first original play at so many amazing venues, and to get such excellent reviews and feedback.